Last season we spent a few days kayak and canoe camping on Adirondack’s, Middle Saranac Lake with a few friends. Dara and I went by canoe since we were taking our cocker spaniel puppy Finley with us. After last season’s camping trip, I decided I would make some bear resistant food containers. I did not say bear “proof” food containers because I have not tested them using a bear. Having nothing planned for today, I made my bear/animal resistant food containers. I started by purchasing most of the items at Lowe’s. There I purchased a four inch by two-foot piece of PVC pipe, two female threaded adapters and since I did not want the clean-out plugs with the square external wrench fitting I purchased two flush clean-out plugs. Flush mount screw-in endcap and adaptor. My thought was an animal could conceivably place its teeth on the square clean-out plug and turn it. Since Lowe’s did not stock flat-bottomed end plugs I went to Riverhead Building Supply and there purchased two of them. 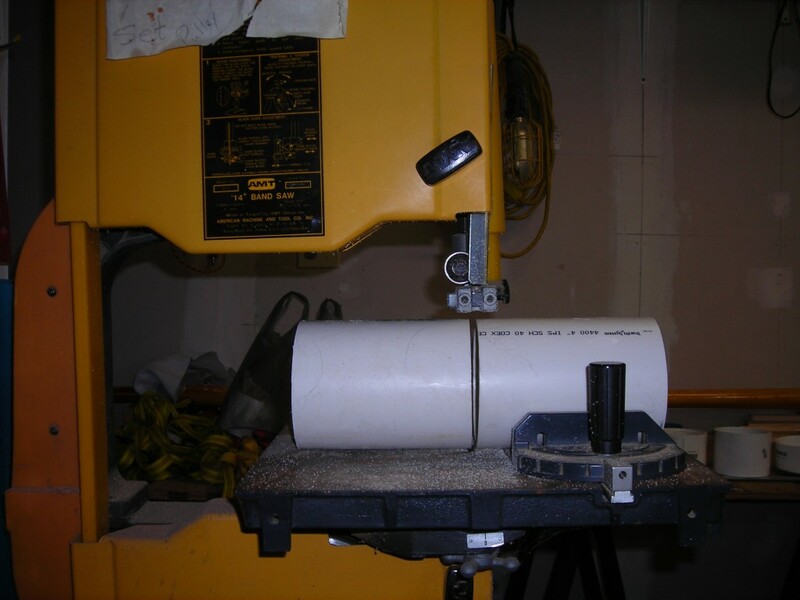 Once home I used my band saw to cut two sections off the PVC pipe one section measuring 5 ¾ inches and the other 6 ¾ inches. Cutting PVE pipe with my bandsaw. To be honest I did not measure either one I just placed them on the band saw and cut them. 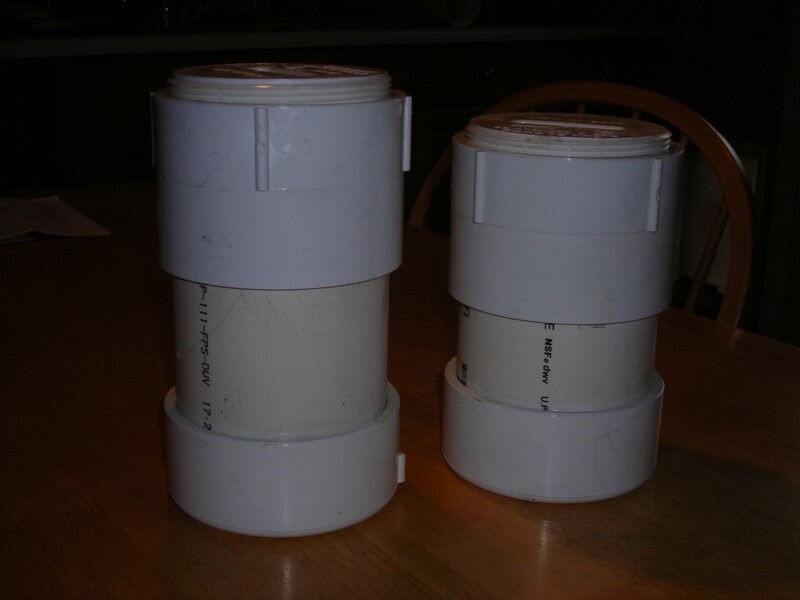 I then glued and assembled my hopefully bear/animal proof food containers. 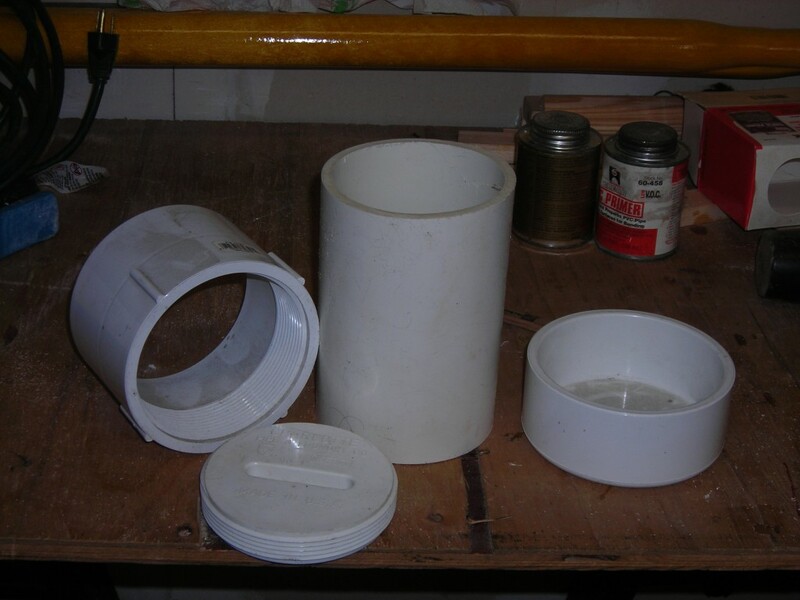 Once assembled the completed food containers measurements came out to be 7 ½ inches on one and 8 ¾ inches on the other. Now before I start to receive comments I am fully aware that my food containers do not meet the National Parks Services requirements for “approved bear proof food containers” in the National Parks or other locations, which require their usage. My intention in building bear/animal resistant food containers was not so much to keep bears from being able to open them and eat the contents as is was to store Finley’s dog food in a safe, waterproof container when we take him canoe camping. My intention was also to build a container that Finley could not open, for when it comes to food; Finley is much more of a threat of breaking into a bear proof food container and eating its contents then the most ravenous bear. Finley on the other hand is much smarter than the average bear.